Madiot at the 2015 Four Days of Dunkirk. Marc Madiot (born 16 April 1959 in Renazé) is a French former professional road racing cyclist and double winner of Paris–Roubaix. He also competed in the individual road race event at the 1980 Summer Olympics. Retired from racing in 1994, he is now best known as the directeur sportif of FDJ, a UCI ProTour cycling team. In 2008 he was made a knight of the French Legion of Honor. It was presented by then-French president Nicolas Sarkozy at the Elysée palace in Paris. He is the older brother of fellow retired racing cyclist and French national road racing champion Yvon Madiot. 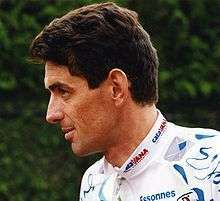 Madiot, as a member of the Catavana team, in 1994. ↑ Clarke, Stuart (5 November 2015). "13 of the strangest nicknames in cycling". Cycling Weekly. Retrieved 11 May 2016. ↑ "Marc Madiot Olympic Results". Sports Reference. Retrieved 7 May 2015. ↑ Henry, Chris (28 January 2004). "FDJeux.com team presentation". cyclingnews.com. Retrieved 31 May 2014.